In order to 'fit' into the business context, much of the fuzziness, uncertainty, irritation and mess that is essential to the creative process is getting expurgated. But such a 'clean process' will deliver at most some incremental innovation. If disruptive innovation is the goal, one has to brave the entire creative process, messiness and all. If Innovation and creativity are key to future success of an organization (study by IBM), design needs to be a crucial part of the corporate strategy. Therefore, designers need a seat at the table to influence and guide top management decisions. Innovation and Design need to be connected and aligned with the business strategy and demand courageous and design driven decision making to really build competitive advantages through design. And, of course, the designers need to be ready to take that seat and deeply understand the business they are in to contribute and co-create at all levels. Technology is no longer the sole driver of innovation. It takes a compelling idea and user-centered design to build a successful start up (of course together with the right code and the clever business model). Airbnb, YouTube, Pulse, just to name a few, are companies initiated by designers. Will we see more design entrepreneurs? Design is democratized - with design methods and techniques open to everybody and the availability of powerful CAD tools, 3D printers and open source coding, it doesn't take an R&D department to turn an idea into a prototype. More than ever before, ideas and the networks we are connected with (open innovation) matter. Crowd-based sites like Kickstarter enable innovators to turn their ideas into an innovation. It's all there, let's stop talking about those great concepts, and team up and start to make them real! Within the last 15 years, (Industrial) Design has splintered into many disciplines from design research, form development, design for manufacturing, usability design, interaction design, service design, experience design, eco-design, universal design to sustainable design, just to name a few. This splintering has made it hard to understand and communicate the potential impact and value design can deliver. I believe, that for strategic designers it's time to consolidate, to still go deep in a particular field, but to go broad in the understanding of the other design disciplines and how they can be aligned to generate full impact by design. Design is a team endeavor and understanding sets the stage for fruitful collaboration. User centered design will be taken to the next level: design for human flourishing. The researchers at the Delft Institute of Positive Design are generating the knowledge that enables designers to formulate effective strategies in contributing to the happiness of people and to design products that contribute to a healthy society: design to make the world a better place. How will we work and communicate? Show - don't tell. there will be no more need for lengthy powerpoint presentations - the future will be visual and haptic, stakeholder presentation will be held in 'elevator-pitch', pecha-kuche-style, including quick prototypes and rapid visualization. Remote tools will become really intuitive to use. Intelligent Interaction will make the most of both worlds - human intellect (creativity, flexibility, embracing fuzziness and ambiguity) and the machine (data and structures). We will be able to co-create remotely using big whiteboards and deep zooming, while the tools won't distract us. The dynamics of interdisciplinary teams won't depend on working in the same location. Change will be a constant in our fast changing world. It demands us to be lifelong learners,- not restless, but always curious. Open university formats like Udacity enable us to broaden our knowledge. The networks we are in will be more important (and constant) for our careers than the companies we work for. Design thinking is a tool to speak across disciplines, to establish a common language and really draw from the diversity of the team. Being a valuable team player with the appropriate soft skills will be a key value. Design Thinking processes will be accelerated by designers doing their job in research, synthesis and prototyping. Speed and quality will propel the team fast into a beta version of the desired future. The interplay of diverge and converge (first problem space, than solution space - the British Design Councils' Double Diamond model, 2005), combined with deep user empathy and an iterative process of sketching, prototyping, experimenting, giving and taking critique and adding on to the ideas of others is and will remain a powerful approach for innovation, no matter if 'design thinking' is a good name for it or not. Design Thinking was helpful to move designers and the power of design from a focus on surface and aesthetics to a much wider field with impact on systems and society at large. The big picture 'wicked' problems of our times, like global warming, health care, short running of resources and overpopulation can't be approached with any conventional tool set. It needs multiple brains working together to make a change. What does all this mean for us designers? Now that Design methods have become heavily used in the corporate world, and design has gained attention and importance as being a competitive advantage, it is about time, that designers gear up, step up and drive the innovation process and not just make the outcome look good. What this means is that designers should learn to speak the language of business and be able to bridge the gap between design and business thinking. Since Design is cherished as an approach to problem solving in a much wider field with impact on systems and society at large, designers will be on their way in many areas besides the traditional design and creative industry. Areas ranging from business (marketing, sales, human resource, business modeling, just to name a few) to social projects and politics. Strategic designers won't have a portfolio with their individual work to show anymore. Of course, unless we are the ones to develop a logo or artifact on our own. But design for styling and surface can easily be replaced or globally sourced. The more strategic the design implementation within a company, the more design is integrated into the business strategy and drives all business activities to better satisfy user needs, the less visible will our individual impact be - a strategic designer acts within a complex system with its own dynamics and constraints, where s/he co-creates and influences other parts of the system. S/he is a crucial part of the system and can't be replaced that easily. In a time where technology is getting smaller and smaller, the tangible physical product is almost disappearing. This opens up new room for designers to create meaning and understanding, instead of surfaces of products. Designers can make the invisible visible. Designers moved from being the 'maker of things', from translators of strategy to being the 'creators of transformation and change'. Our mindset, our methods and our approach to problem solving opens up entirely new fields for designers to position their way of thinking (besides the design world) - we get to be involved in non-traditional design fields from marketing to sales, business modeling, to entire systems and society at large. Design is the process for change. Designers can create a vision to motivate, engage and drive people, designers can facilitate change. Everything that can be improved upon is an opportunity for design. So, don't call in a designer to change the curves of your product - call him in to change the world - with you. If "visionary" is the attribute a business seeks, then these seven qualities are a must. Innovation occurs at the intersection of disciplines and needs radical collaboration between people with very different backgrounds and viewpoints. Tim Brown introduced the term "T-shaped" to describe people who have depth of skills and experience in one discipline, represented by the vertical stroke, while also having a broad understanding and experience in various disciplines, represented by the horizontal stroke. A breadth of knowledge and cross disciplinary competence provide empathy for other disciplines and sets the stage for a fruitful collaboration. Empathy allows us to imagine the problem from another perspective, to walk in somebody else's shoes. People with cross discipline competence are open and enthusiastic about other people's disciplines. This is very valuable in collaboration, as people add onto the ideas of others, as they listen carefully and ask the right questions, this is when the magic of teamwork happens and the ideas, that many brains worked on start to soar. On the other hand I-shaped individuals have a hard time with collaboration. What tends to happen is that each discipline presents its own solution. Collaboration becomes a negotiation as to whose idea wins. To wrap it up, becoming more T-shaped is good advice in our interconnected world, it enriches communication, collaboration and opens doors to other disciplines. Designers especially need to stay curious, broaden their skill set across other disciplines (especially across other design disciplines) and become life long learners in a world, where knowledge is a key resource. Design and business challenges increasingly need to be approached in a more integrated manner. Workshop moderation is an evolving opportunity for designers who want to work on a more strategic level. To set up a workshop, to design agendas and activities, to facilitate a diverse group and to create effective solutions needs strong communication skills and quiet a bit of psychological insights. The challenges in facilitation start with the brief, often with the question of whether problem space and solution space are really open and e.g. 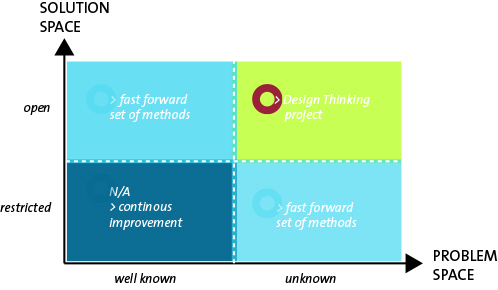 Design Thinking is the right approach, followed by the question who can/ should be on the team. Investing in briefing and clear communication of project parameters, before the project gets to the starting line, is always a good idea. Besides knowing the process, tools and methods, coaches need resources, strategies and insights to guide people effectively through a collaborative process. A good coach needs to enable and empower participants to take responsibility for their outcomes. It is crucial to understand underlying group dynamics, bring everybody to the same page, develop trust and empathy within a team, guide the team through difficult phases of frustration and the feeling of getting lost. Every team hereby has to go through four stages (according to Tuckman's model of team development and behaviour, Dr. Bruce Tuckman 1965). Team members that are aware of what stage they are currently in and what the group's particular dynamics are, have a better chance of collaborating successfully. A design background combined with strong communication skills prepares well for a deeper dive into moderation. Designers bring knowledge and design methods to the process, and ideally spark the 'creative confidence' of the (hopefully T-shaped) group members.